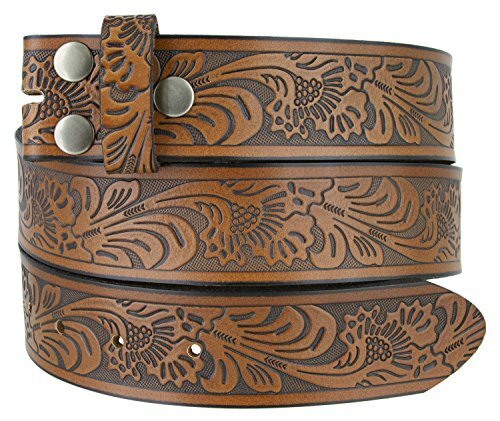 Western Floral Embossed Vintage Soft Genuine Leather Belt Strap 1.5'' (Brown, 32) by Belts.com at Lamont Design. MPN: BS220-BRN-32. Hurry! Limited time offer. Offer valid only while supplies last. Made from a single piece of real leather. Absolutely no bonded scraps or polyurethane glue. Western Style Design With Hand Brush Oil Antique Look. Made from a single piece of real leather. Absolutely no bonded scraps or polyurethane glue. Western Style Design With Hand Brush Oil Antique Look. Tooled details along the belt sure to add style texture to any look with denim or khakis. An instant classic to any belt collection. 1-1/2" width with 7 size notches(9 inch apart) to adjust a full size up or down and for your overall comfort and ease. Snap design allows for easily interchangeable belt buckles(Sold Separately). This belt strap is measured from the fold to the middle hole on the tip end. SIZING: The best way is to measure where you wear the belt, over a pair of pants, and go with the closest size. Since pants sizes are often inconsistent with actual inches, it is important to measure directly. If you have any questions about this product by Belts.com, contact us by completing and submitting the form below. If you are looking for a specif part number, please include it with your message.